The La Quinta Inn & Suites San Antonio North Stone Oak has been awarded the 2016 TripAdvisor Certificate of Excellence award. Be amongst the first to experience our newly renovated La Quinta Inn & Suites San Antonio North Stone Oak. 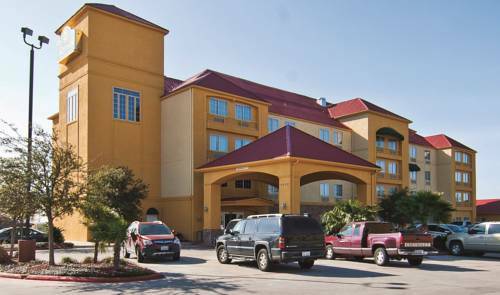 New dcor throughout the hotel and guestrooms will completely enhance your guest experience The La Quinta Inn & Suites San Antonio North Stone Oak is just north of downtown San Antonio, minutes from the San Antonio International Airport, Randolph Air Force Base and Ft. Sam Houston. Only minutes away from Six Flags Fiesta Texas, San Antonio Riverwalk, the Alamo, San Antonio Zoo, Alamodome, Northwoods Shopping Center, La Cantera Mall, Northstar Mall, and AT&T Center. The hotel is surrounded by dining establishments such as Carino's Italian Grill, Aldino, Sushi-Zushi, Buffet King, Luby's, Applebee's, and Chuy's Mexican Restaurant, all less than 2 miles from the hotel and some within walking distance. Work out in our 24-hour fitness center, then enjoy a refreshing swim in our heated indoor pool or relax in our spa, both are open 24 hours. Guests will enjoy our spacious rooms, cable w/HBO, free wired and wireless high-speed internet access, 24-hour business center, so you can stay connected, and a Free Bright Side BreakfastTM that include eggs, biscuits and gravy.. and of course our Texas size Belgium Waffles.